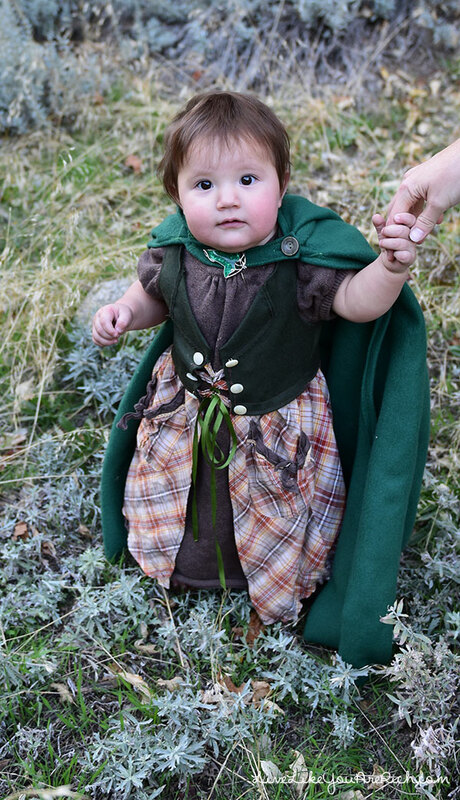 This is a homemade Hobbit costume for a baby girl. As a Lord of the Rings and Hobbit fan, it just makes me happy. My daughter, Aurora, is such a sweet, happy, and lovable girl. 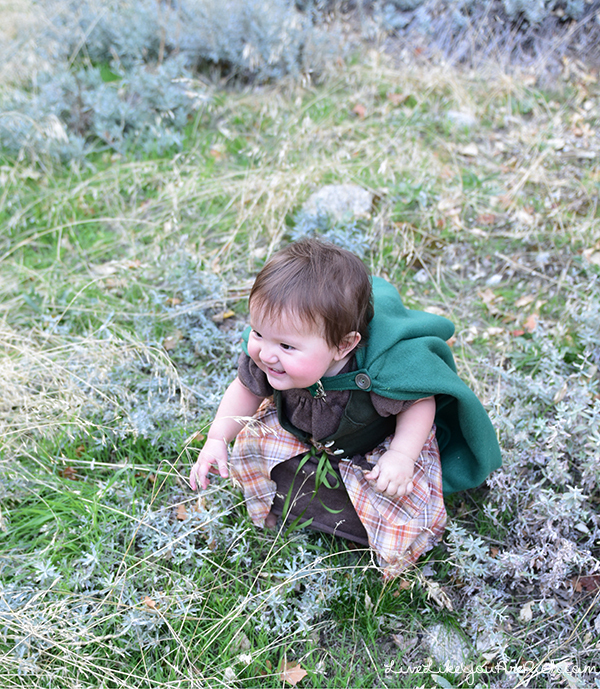 She loves being in the mountains and playing with the weeds, grass, and leaves which is of course, very hobbit-esk. So this is just the perfect costume for her! To make the dress, find a solid colored dress or a shirt that is large enough to be a dress and use it as the bottom layer. Bonus if it has slightly puffy sleeves. Then find an apron or a skirt and a vest or material to sew a vest (many of these items can be found at thrift stores). Sew the skirt and vest together. Sew on buttons and ribbon holders. Tie with a ribbon. 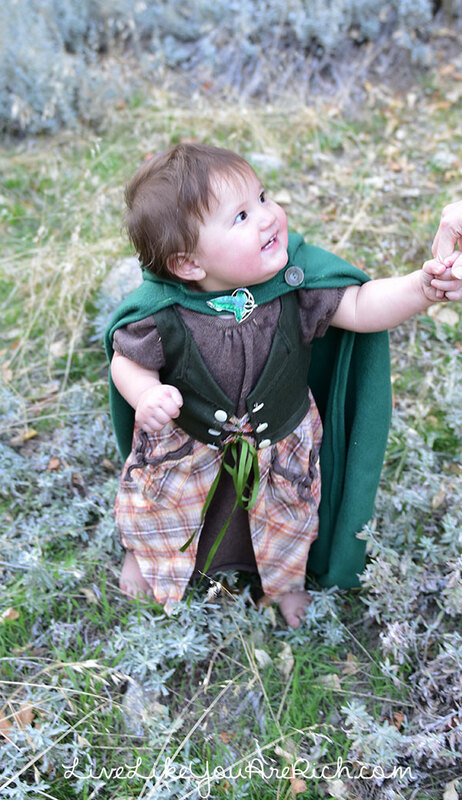 For the cloak pin (Elven pin) you can buy it on Amazon for a few bucks here. 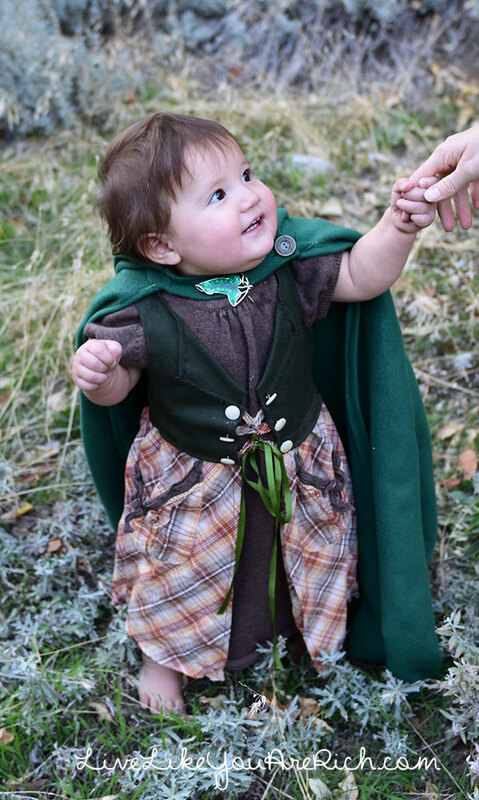 Then get dark green felt and one large button for the cloak and follow a pattern like this—making it smaller for a baby or child. I made hobbit feet for my son and his friend (posts coming soon) but I didn’t make any for Aurora. I’ll link to the tutorial here after I post it in case you would like to know how to make them. They can easily be modified for a baby. Then we went to a place that could resemble a scene from The Lord of the Rings or The Hobbit to take photographs. 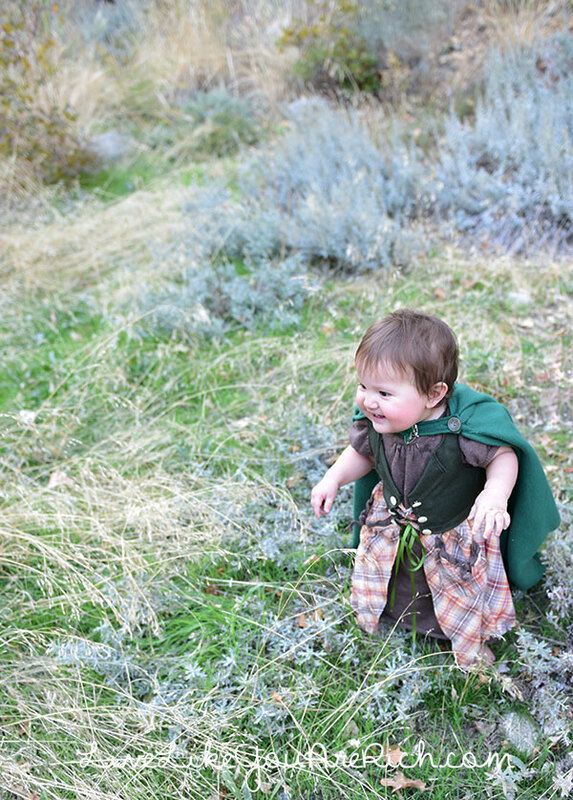 Since I still have some time, I may figure out a way to make her hair curly and make her hobbit feet for Halloween as well. Isn’t she so sweet? She just totally melts my heart. Can I just say that this is like my favorite costume ever! You did SUCH a great job! I can’t wait to see the toddler version!! 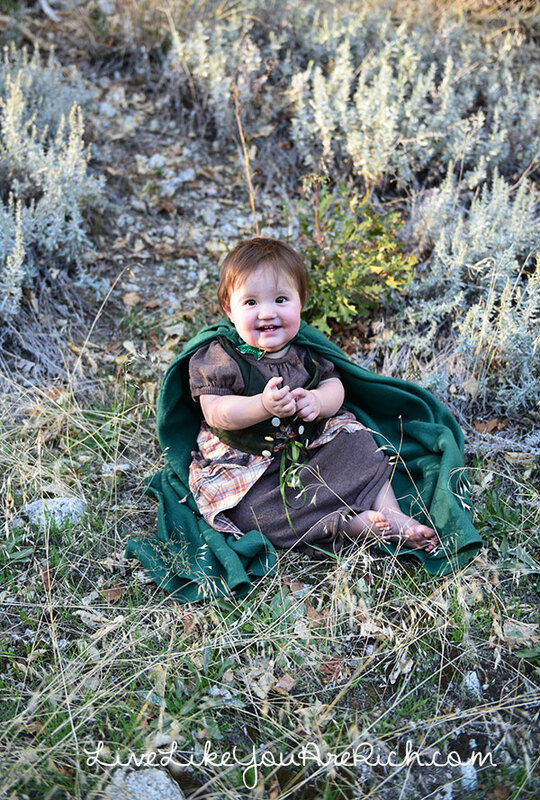 This is an adorable costume, but your little model is just too cute for words! Ahh thanks!! I think so too. Absolutely adorable! 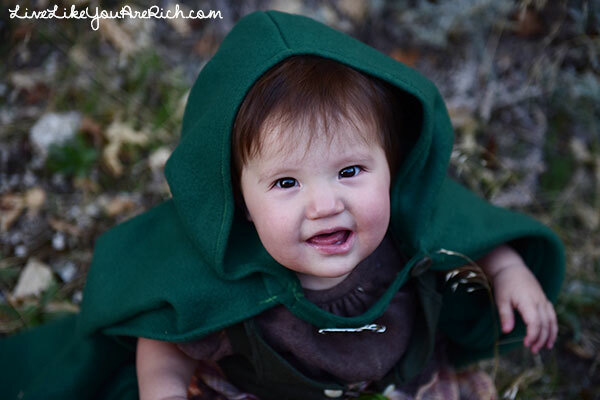 The baby and the costume- Great work! Thank you so much. I had so much fun seeing her wear it! Oh my gosh, cuteness overload! Thank you so much for sharing with us at Thursday Favorite Things blog hop.